Jacques-Yves Cousteau ƿæs geboren on 11um Sēremōnþes, 1910 in Saint André de Cubzac in Franclande and forþfērde on 25um Sēremōnþes, 1997 in Parise. Hē ƿæs Frencisc sciptoga and explorer and researcher. Hē leornode þā sǣ and ealle þe lifdon in ƿætre. Man cnǣƿþ Cousteau in Franclande mǣste sƿā le commandant Cousteau (Bebēodere Cousteau). Man sægþ his naman sƿā Cū·stō. Man ālīefede hine in þǣm Ēcole Navale (Scipfierdlic Scōlu) in Breste. He ƿearþ scēotunggerēfa þǣre Frenciscan Scipfierde, and þurh þis cƿōm tō him byre ǣreste cunnian under ƿætre. In 1936 he cunnode cynn underƿæterlicra glasa, and mæg bēon þæt of þissum cƿōmon dȳfera ēagegriman. In 1937 ƿīfode hē Simone Melchior. Hē fōhte in þǣre Ōðeran Ƿoruldgūðe sƿā dyrnscēaƿere for þǣre Frenciscan dyrnfierde, and þenden man fōhte hē fand tīd for þǣm hē and Emile Gagnan macodon þæt forme cynnes ābiddungǣðmendra lyftǣðmungsearƿa, þe is se aqualung, in 1943, and of þissum cƿōm mǣst þǣre dȳfunge mid scuban in þǣre ƿorulde. Hē sōhte gōd lyftǣðmungsearƿu æfter þæt tƿuƿa mid oxygenongēanǣðmungsearƿe hē hæfde oxygenfylleƿærcas and gesƿogunge. Æfter þǣre Ōðeran Ƿoruldgūðe þenden hē ƿæs giet scipfyrde sciptoga, hē macode ƿeorcƿegas tō findenne ūtberstendas in Franclandes hȳðum and sƿēaƿode in gesuncenum scipum. Man nemnede hine foresittend þāra Frenciscra Farunga tō Scēaƿianne þā Sǣƿa. In 1950 he bōhte his mǣre scip Calypso, and in him hē fōr tō manigum sǣm and tō sumum ēam. In þissum farungum he macode manige bēc and āstyriende gelīcnesse. Hē geƿann þrēo þæs myrcenses Oscar for þǣm āstyriendan gelīcnessum The Silent World, The Golden Fish, World Without Sun, and manige ōðre hēam myrcelsas and in þissum ƿǣron se Palme d'Or in 1956 æt þǣm Cannes Film Festival. Þurh his geƿeorce þǣre ƿorulde folc geleornode micel ymb underƿæterlicre libbendcyþþe. In 1963 Cousteau and Jean de Wouters searƿodon þone underƿæterlican leohtātīefrend genemnedan "Calypso-Phot", and æfterra hē alīefede Nikon macian hit and hit ƿearþ se "Calypso-Nikkor" and æfter se "Nikonos". ǣ Hē and Jean Mollard macodon þone SP-350, þe is tƿǣm mannum undersǣbāt þe cūðe dȳfan 350 metras under sǣ. Spēoƿ þissum, and in 1965 hē dȳfede tō 500m mid tƿǣm undersǣbātum. Man sette Cousteau sƿā stihtere þæs Sǣcræftlican Stǣrhēddærnes Monacos, and Cousteau scōp þæt Undersǣs Þurhsmēagunggefēre in Toulone, ƿæs se lǣdere þæs Conshelf Saturation Dive Program (long-term immersion experiments, the first manned undersea colonies) and was one of the few foreigners that has been admitted to the American Academy of Sciences. Cousteau ƿearþ mǣrora. In Ƿinterfylleðe 1960 EURATOM ƿolde āƿeorpan in sǣ micelne radioactiviscne þreax. Cousteau organized a publicity campaign which gained wide popular support. Ƿīfa and cildru sǣton on þǣm īrenƿege and forstoppodon þone geƿægnoþ, and man þorfte senden þone þreax tō þǣm stede þanon hit cƿōm, and þæt plēo endode. In þǣm æfterran Blōtmōnaðe Charles de Gaulle Francrīces foresittend ēode to Monaco and þǣr ƿordum ƿrixlode ymb þæt þe gelamp on Ƿinterfylleðe geares 1960 and ƿīdorlīce ymb cyrncræftlīe cunnungum. Ǣrra Francrīces ambaht segde þæt betere ƿǣre gif Rainier æðeling ne sprece ymb þis, ac man segde þæt se foresittend frēondlīce āscode Cousteau to be kind toward nuclear researchers, and Cousteau (allegedly) replied: "No sir, it is your researchers that ought to be kind toward us." 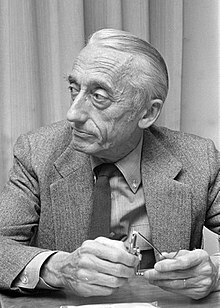 During this discussion Cousteau found out that the reason for French experiments and research was American refusal to share its atomic secrets with its allies. In 1974 he ongann þone Cousteau Society for the Protection of Ocean Life, and in þissum nū sind māran þonne 300,000. In 1977 man geaf him and Peter Scott þæt sigetācn gehāten "UN international environment prize", and fēaƿe gēaru ǣfterra Jimmy Carter Foresittend geaf him þone American Liberty Medal. In 1992 inlāðode man hine tō Rio de Janeiro, Brazil for the United Nations' international conference on environment and development, then he became a regular consultant the UN and the World Bank. Cousteau nemnode georne hine "oceanographic technician". He was in reality a sophisticated lover of nature, especially that of the sea. His work allowed people of all continents tō visit life under the ocean's surface and explore through television the resources of the "blue continent". Jacques Cousteau forþfērde on 25um Sēremōnþes 1997 and man byrgede hine in Cousteau cynnes byrgenlande in Saint-André-de-Cubzac lictūne in Franclande. Man nīwanost wende þisne tramet on þǣre 17:09 tīde þæs 30 Ēastermōnaþ 2018.